First Sentence: St Botolphs was an old place, an old river town. I finished reading The Wapshot Chronicle* last week, and then promptly forgot about doing anything else with it, including making a new item on my to do list about writing a review. Once this is written I’ll probably never think about it again. 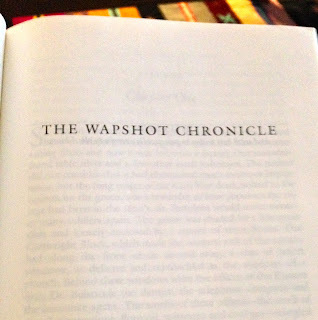 I didn’t like The Wapshot Chronicle at all. Set in various locations, but perhaps primarily New England, it tells just a portion of the story of a few living generations of the Wapshot family. There is Leander, his two sons Moses and Coverly, and a cousin Honora, who is, I think, from the generation before Leander. I was paying attention but I didn’t care much. I found this book completely inert and uninteresting. A bunch of things happened, and I didn’t care about them, and I felt no connection to them whatsoever. There wasn’t any energy or life to the characters, except in a few isolated moments. Was the book supposed to be a bit funny? Maybe, but I didn’t see it. There’s also a truly baffling chapter in which Coverly encounters homosexuality. I feel as though he was being set up as being gay early on, and then he meets a gay man who likes him, and then…? When I say baffling, I mean it. Coverly is married to a woman that he seems to truly care for and feel attraction to, and then he renounces his heterosexuality for a minute or something, and then that’s never mentioned again? * The List calls this The Wapshot Chronicles, and there’s actually a sequel to it called The Wapshot Scandal that makes me wonder if the pair of them weren’t supposed to be considered together for this item. But, as I said when I started on The Alexandria Quartet, when it comes to series, I reserve the right to quit after any book, so it doesn’t matter whether The List has a typo on it or means two books instead of one. I’ll be counting this as one for statistical purposes, though. "We're going to England in ten days," Pancras said. "I'll miss you," Coverly said. "You're coming," Pancras said. "I've arranged the whole thing." Coverly turned to his companion and they exchanged a look of such sorrow that he thought he might never recover. It was a look that he had recoiled from here and there—the doctor in Travertine, a bartender in Washington, a priest on a night boat, a clerk in a shop—that exacerbating look of sexual sorrow between men; sorrow and the perverse wish to flee—to piss in the Lowestoft soup tureen, write a vile word on the back of the barn and run away to sea with a dirty, dirty sailor—to flee, not from the laws and customs of the world but from its force and vitality. That hairline where lovers cease to nourish and begin to devour one another; that fine point where tenderness corrodes self-esteem and the spirit seems to flake like rust would be put under a microscope and magnified until it was as large and recognizable as a steel girder.